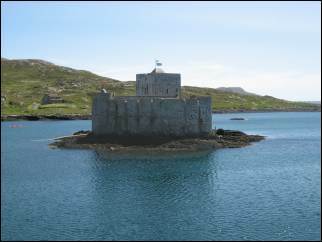 Kisimul Castle sits on a rocky islet in the bay just off the coast of Barra. Legend has it that this has been the stronghold of the MacNeils since the 11th century. 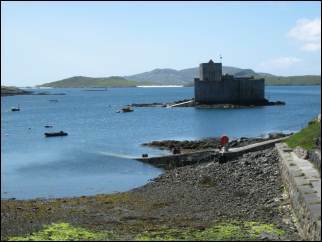 His son Ian Roderick, Professor of Law, took over the castle and is still the current Chief of the MacNeils of Barra. In March 2000 it was announced that he had handed the castle into the care of Historic Environment Scotland on a 1000-year lease with an annual token rent of £1 and a bottle of whisky. This will ensure that conservation work will continue to maintain the castle for generations to come. A small boat from the slipway takes tourists across to the castle during the summer (daily from 1 April to 30 September). Admission charge to the castle includes the boat fare. Tel: 01871 810313 or contact Historic Environment Scotland. All photos on this page © The Internet Guide to Scotland. Not to be reproduced without permission. Began as a 19th-century fishing port, the town of Castlebay is now home to a couple of hotels, church, post office, bank, school, supermarket, petrol station, café, community shop, swimming pool, sports hall, heritage centre and tourist information centre. A Caledonian MacBrayne vehicle ferry arrives here from the mainland and from South Uist. 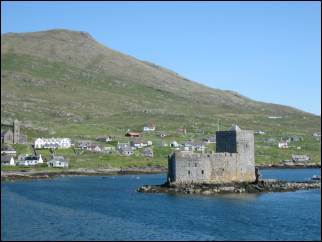 A few miles west of Castlebay is MacLeod's Tower. 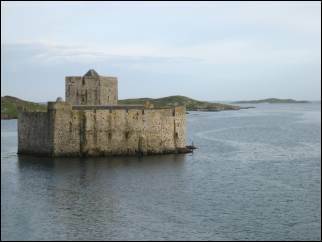 Located on an islet in Loch Tangasdal this is a medieval tower-house which originally had 3 storeys. Nearby is the so-called St. Columba's Well. The Internet Guide to Barra: accommodation, sightseeing, transport, tours, etc.